What a way to use as many items from our Greenling box as possible! We’ve been getting okra and squash for the last few weeks, and we got garlic last week. 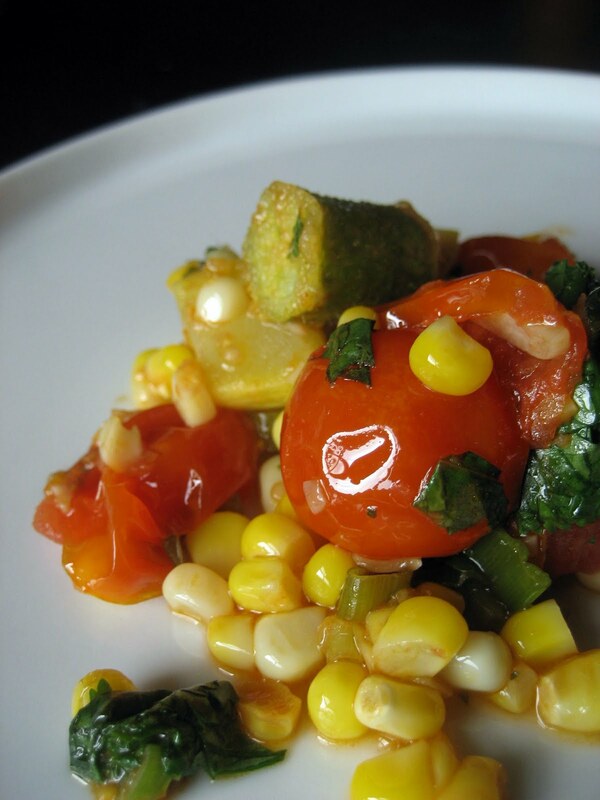 Fresh corn and really ripe tomatoes have been abundant for a few weeks now too, so this was the perfect dish to use all of that beautiful produce. I served this with simple grilled chicken, but this side dish was really the star of the meal. It makes at least 4 servings for hungry people, so we had plenty of leftovers. In a small bowl, toss the sliced okra lightly in the cornmeal to coat. Heat 1 Tbsp. oil in a large skillet over medium-high heat. Shake off the excess cornmeal with a slotted spoon, then add the breaded okra to the skillet and saute until coating is golden brown, stirring occasionally, about 6 minutes. Using a slotted spoon, transfer the browned okra to paper towels to drain; sprinkle with salt and pepper. Wipe out the skillet. Lower the heat to medium and heat the remaining 1 Tbsp. oil in the same skillet. Add corn, squash, and garlic and saute for 2 minutes. Add tomatoes, then cover and cook until squash is crisp-tender, about 5 minutes. Mix in okra, cilantro, and green onions. Remove from heat. Season to taste with salt and pepper, then serve immediately. I couldn’t stop eating this. There were so many flavors and textures going — the brightness of the cilantro, the pungent acidity of the okra, the sweetness of the corn. And the colors were beautiful! However, the cornmeal breading didn’t stay on the okra at all. I think I could’ve skipped that step and just browned the okra with the squash. However, if you want a true fried okra feel to the dish, I’d dredge it in egg before coating with cornmeal to ensure that the breading sticks. We received a huge bunch of mint in our Local Box last week, so I thought that using the mint in the champagne cocktails would be the perfect opportunity to show off Greenling at Theresa’s lingerie shower. Lychees are small, whitish-pink, round fruits that are common in Asian cuisine. They’re sweet, but not overly so. You can find them in the Asian food section of your grocery store. They’ll usually come in a can with the syrup. Save the syrup, as I like adding it to my cocktail along with the actual fruit. Sparkling wine, champagne, prosecco, cava — whatever you have! Add the lychee and syrup to the bottom of a champagne flute. 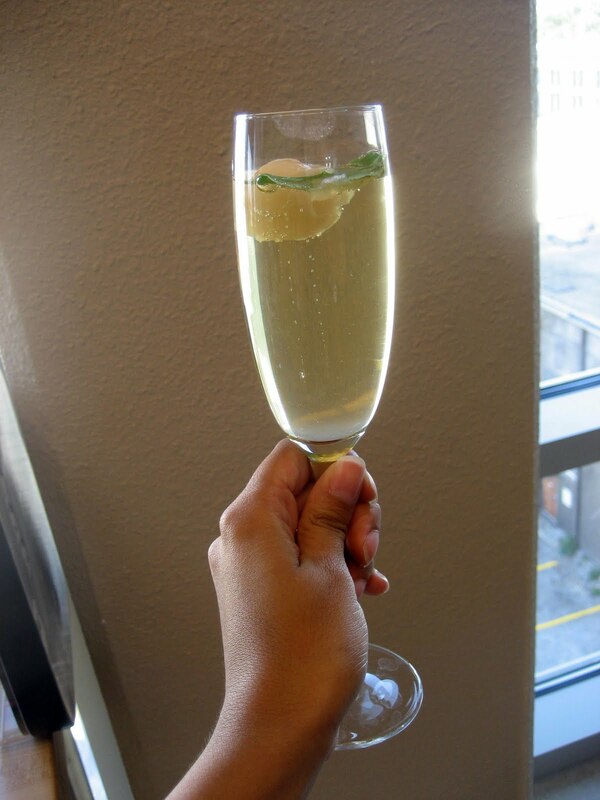 Bruise the mint leaves by rolling them between your palms or fingers, then add to the bottom of the champagne flute. Fill the flute with champagne and enjoy! Yummy, bubbly goodness. The lychee syrup infuses the champagne with a subtle sweetness and the mint gives it just a hint of menthol. This is one of my favorite cocktails. In our box this week, we’re getting blueberries from Berry Best, canary melon from Tecalote, basil from Montesino, herbs from Tecalote, limes from G&S Groves, lettuce from Bluebonnet Hydroponics, squash blossoms from Montesino, bell peppers from Tecalote or My Father’s Farm, eggplant from Tecalote, summer squash from Naegelin, baby leeks from Animal Farm, and garlic from Montesino. We’re traveling to a wedding this weekend, so I’m trying to use up as many of the perishable items quickly. For the morning before we travel, I’ll make a hearty fritatta with baby leeks, squash blossoms and herbs. I’ll also make grilled veggie sandwiches (made with grilled eggplant, summer squash, and bell peppers) spread with basil pesto to take on the plane. When we get back, I’ll use the canary melon and limes to make agua fresca (probably add some ginger to cut through the sweetness) and a blueberry clafoutis. In my neverending quest to cook lettuce, I found this recipe for lettuce soup. Seems a bit strange, but looks easy and tasty. Seems pretty healthy also! Squash blossoms are a rare luxury at farmstands or farmer’s markets. When they came in our Greenling box this week, I was so pleasantly surprised by the novelty of such a rare find and at how fresh they were. I was planning to make stir-fry for dinner, so I borrowed some of those flavors to stuff the squash blossoms with somewhat non-traditional flavors. Keep in mind that when cooking with squash blossoms, you’ll want to rinse them, then slice them open vertically down one side of the flower and remove any insects that may be lurking in there (we had a few!). You’ll also want to remove the stamen. Slicing them makes it much easier to stuff the blossoms with cheese. Adjust the quantities below as appropriate for as many squash blossoms you have. I got 1 large and 4 smaller squash blossoms in my Greenling box, which yielded 3 stuffed and fried blossoms, since I overlapped the smaller ones to create a bigger squash blossom. Clean and prepare the squash blossoms. Combine the goat cheese, green onions, garlic, ginger, salt and pepper in a small bowl. 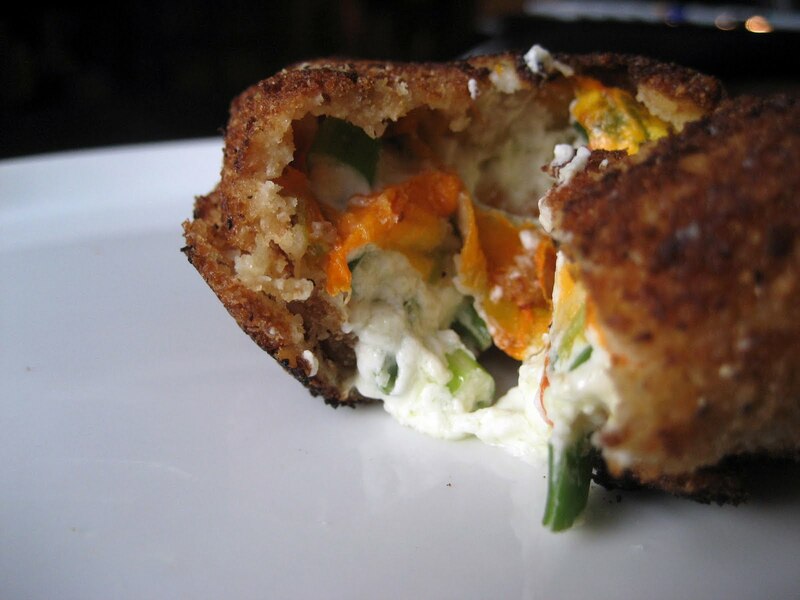 With the squash blossom sliced open, add a dollop of cheese filling to the center of the blossom. Fold the sides of the squash blossom around the filling to close it. Repeat until all squash blossoms have been filled. Freeze the squash blossoms for ~10 minutes to firm up before frying them. 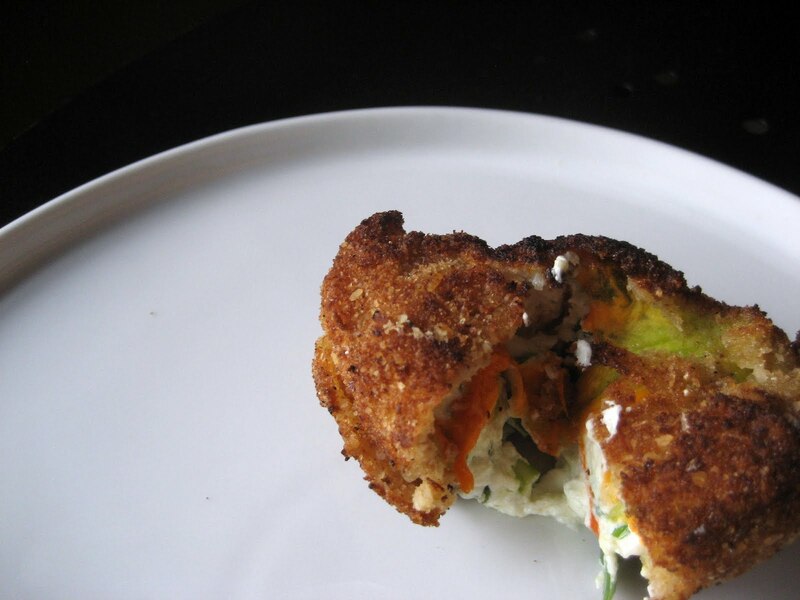 After 10 minutes of freezing, dredge the squash blossoms first in flour, then egg, then breadcrumbs. I wanted a thick breading, so after dredging the blossom in the breadcrumbs, I repeated the egg and breadcrumb step for a second coat. Heat the oil over high heat in a large skillet, then fry the breaded squash blossoms until browned on all sides (only took ~2 minutes total). Drain the excess oil on a paper towel and serve immediately. The crust was quite crunchy. And the hot cheese oozed out of the blossom when I bit into it. Granted, when you fry anything, it’s bound to be good, but these were fantastic! I really liked the flavors in the goat cheese and they went well with our accompanying stir-fry. I’d highly recommend double-breading; the crispy, crunchy crust was fantastic and a great difference in texture from the gooey goat cheese. I have an unhealthy obsession with sausage (Exhibit A: here). It really is unhealthy, which is why I rarely have it, and when I do, I usually use chicken or turkey sausage. We’ve been getting plenty of summer squash in our Greenling boxes, and while slicing and grilling them or eating them on kabobs is great, this was a welcome change. The recipe made a ton of filling, and even after I filled 8 zucchini boats, I still had plenty left over. Cut the squash in half lengthwise. Scoop out the inside and reserve half of the squash innards. Set the squash halves in a baking pan with 1/4″ of water in the bottom (the water will help the squash cook more evenly). Over medium-high heat, saute the onion and garlic with ~1/4 salt in 1 tsp. olive oil for about 3 minutes, until they get soft. Add the reserved squash innards and mushrooms and saute for another 2 minutes. Remove the mushroom-onion mixture from the pan and add another 1 tsp. olive oil. Crumble the chicken sausage into the pan and saute until browned (~5 minutes). After it’s browned, add the mushroom-onion mixture back into the pan and toss together. Add the wine, tomatoes and basil, as well as the other ~1/4 salt and few grinds of pepper, and let cook for a minute or so more. Remove the pan from the heat and stir in the egg and parmesan. 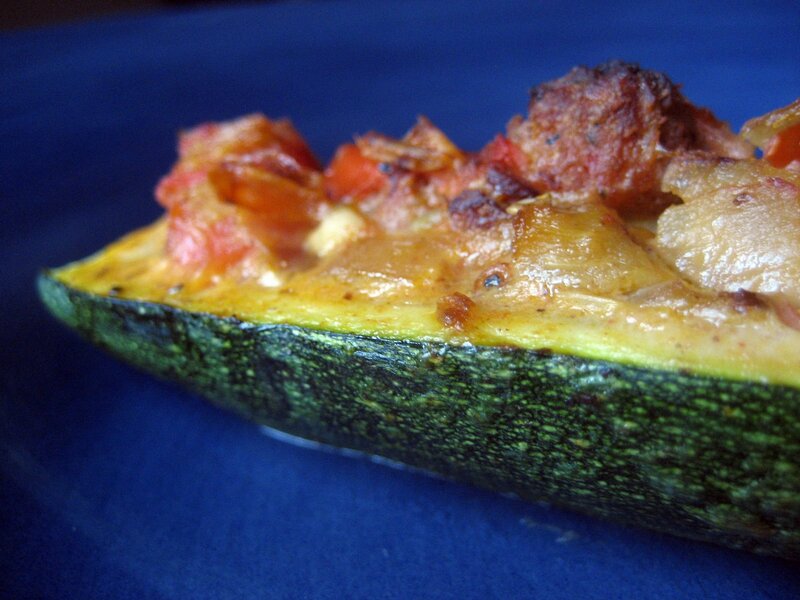 Fill the squash halves with the sausage mixture and bake for ~40 minutes until browned. This meal was unexpectedly light, even with the sausage, most likely due to all of the veggies and fresh herbs. The squash was tender but not mushy and the sausage was crunchy on the outside. The flavors were fresh and vibrant, even for a comfort food meal! My tomatoes were pretty ripe and there was a bit more liquid in the pan than I expected, so I let it reduce for a few minutes before finishing with the egg and parmesan. Glad I reduced the amounts of salt and oil in this recipe — I didn’t miss either. Greenling brought us a beautiful bunch of basil and some cute little eggplants this week. I was still feeling inspired by the cooking class at Thai Fresh, so I decided to make a Thai dish to go with our lettuce wraps. 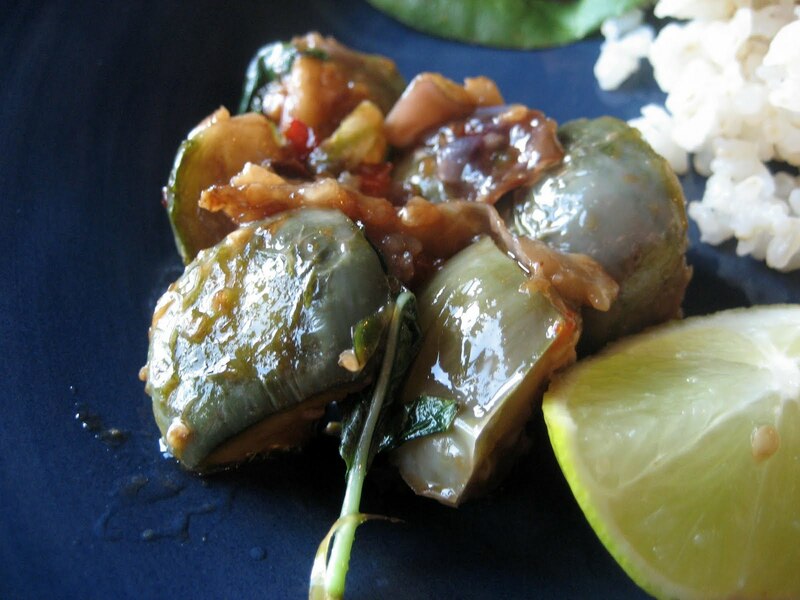 Chop the eggplant into chunks so that they are easier to flip in the pan. The skin should be left on. 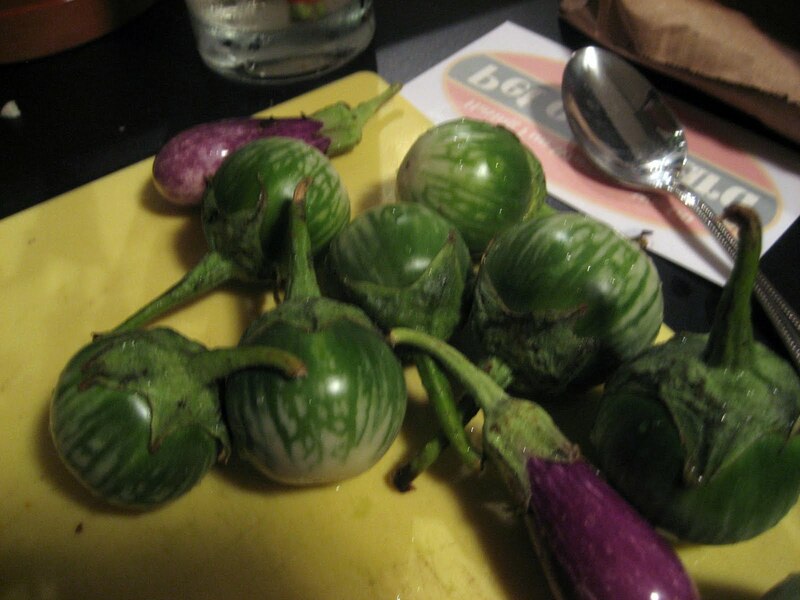 Greenling sent the cutest little mini eggplants, so I just quartered them. Heat the canola oil over high heat, then add the garlic and jalapenos to the wok or skillet and saute until the garlic is lightly browned. Add the eggplant to the pan and saute for a minute, then add the water. Cover the pan and let simmer for ~6-7 minutes until the water has evaporated and the eggplant is cooked. Add the basil, sugar and fish sauce and toss to coat in the eggplant mixture. I left the basil whole so that it wilted in the mixture, but it can be chopped also. Remove from the heat and serve immediately. I squeezed a bit of lime over the eggplant when it was done. Divine! I’ve been looking for new ways to use the lettuce that comes in our Greenling boxes. It’s hard! I ordinarily think of lettuce as a component in salads and on top of sandwiches, and not much else. But I’m trying to expand my lettuce horizons. I’ve heard that some use it as a substitute for heartier greens, like kale or spinach, but I’m not exactly ready for lettuce chips yet. Over high heat, heat the oil in a skillet, then add the chicken. Cook for ~2 minutes until the chicken is no longer pink on the outside, then add the mushroom. Cook for another minute. Add salt and pepper to the chicken-mushroom mixture. Add the garlic, ginger, water chestnuts and green onions, then saute for a ~2 more minutes. Add the hoisin and toss everything to coat. Remove from the heat and serve wrapped in lettuce leaves. Not exactly like PF Chang’s, but pretty close! 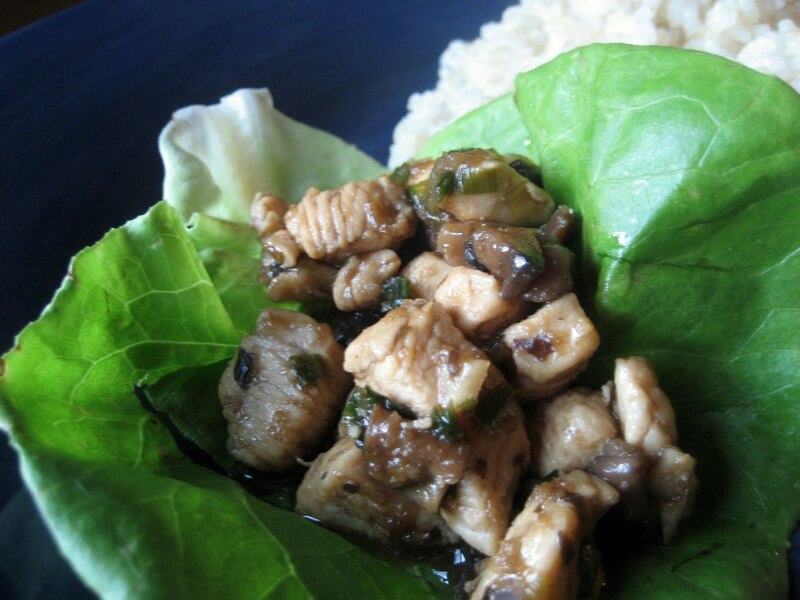 I really liked the crunch of the water chestnuts and lettuce and the sweetness of the hoisin.